Undertaker did not actually appear on Smackdown, but did accept Bray Wyatt’s challenge for a tag team match at Survivor Series. Also, Kalisto beat Ryback clean. The show started with a recap of Seth Rollins’ injury and they plugged tonight’s tournament matches. The Wyatts interrupted and a video recap was shown of the angle with Undertaker and Kane from Raw. They piped in some crowd booing as the Wyatts stood in the ring. 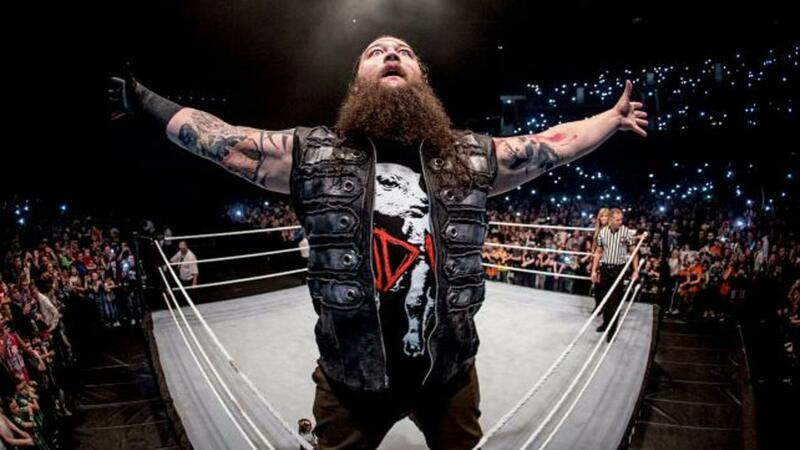 Luke Harper said they would sacrifice “dem Uso boys” to honour Bray Wyatt. Erick Rowan said Bray brings sorrow to those who oppose him and they would do the same tonight. Braun Strowman said “Look at my face… and see your annihilation.” Strowman added that he would pile bodies to the sky for Bray. Bray said Kane and Undertaker may have escaped the pits of hell but they’ll never be the same again. He’s taken pieces of them and now they are apart of him. Bray challenged the Brothers of Destruction to a tag match at Survivor Series against two of his men, and gave them until the end of tonight to accept. Some of the crowd did the Fandango dance and he danced too until he got into the ring, saw the Wyatts and resigned himself to his fate. He started with a dropkick but Strowman tossed him around and won with the head-and-arm choke in less than 2 minutes. Fandango actually tapped instead of merely passing out. They showed a clip of Neville from earlier tonight saying Barrett was embarrassed on Raw and he would finish what Wayne Rooney started with a Red Arrow. This was not an inset promo, but rather a clip from what looked like a sit-down interview. This is a much better idea than the usual inset promos. They did a dangerous spot early in the match where Barrett hung Neville’s feet over the top rope and then just slammed him head first into the mat. Neville rolled to the outside selling his head and Barrett followed him out, slammed his head into the announce table and launched him into the barricade. After a break, Barrett used a pump handle slam and continued working over Neville. Barrett slid Neville to the outside and he crashed into the barricade. Barrett took some time to tell the announcers that he would be the next champion. Neville ran along the top of the barricade (a la Jeff Hardy) and hit a flip dive on Barrett. He used kicks and a standing shooting star press in the ring for a two count. Barrett hit a back kick for a two count and argued with the referee that it was a three, accusing him of taking a pay off from Neville. Neville came back with a German suplex but Barrett followed with a swinging side slam. Neville countered Wasteland into a DDT and landed Red Arrow for the win. This was good. It went about 14 minutes and Neville took a beating. They announced Neville vs. Kevin Owens for Raw. Backstage, the Usos told Renee Young that they have a rivalry with the Wyatts and weren’t about to be sacrificed. Jimmy was taken out by Strowman two months ago and they weren’t going to forgive and forget. Kalisto said he respects Ryback but he shouldn’t be underestimated. He then spouted some cliches about being an underdog. This was another sit-down interview, but the material sucked. Ryback did an inset promo. I’m not really sure what Ryback said, because he spoke quietly as his music played in the background and his fireworks went off. He thinks he’ll be champion, probably. They shook hands to start but Kalisto quickly began kicking away. He hit Salida Del Sol a minute into the match but Ryback kicked out aggressively at two, sending Kalisto to the outside. After a break, Kalisto used more kicks, but Ryback just picked him up and hit a spinebuster followed by two hard powerbombs. This presumably could have been a finish but Kalisto rolled to the outside. Ryback took control until Kalisto dropkicked him to the outside. Kalisto tried an Asai moonsault but Ryback slammed him into the mat (they messed this up). Kalisto countered a shell shocked into a rollup for a near fall. Ryback hit a meat hook clothesline but Kalisto got his foot on the rope. Ryback tried a backdrop off the top rope, but Kalisto countered into Salida Del Sol for the pinfall win. Ryback kicked out just after the three count. The match was good, not great, but Kalisto really got over well here and this might’ve been the highlight of the show. The crowd popped and the commentators put this over as a big upset win. Ryback shook Kalisto’s hand afterwards. Alberto Del Rio and Zeb Colter did a promo on the stage. Colter said the United Kingdom was really the Divided Kingdom because all the countries hate each other. He called the people haters, but him and Del Rio have eradicated hate in MexAmerica. Del Rio said the fans of the two “soccer” teams hate each other but they should be united. Colter said they would unite the MexAmerica Title (U.S. Title) with the World Title. This really sucked. The crowd chanted “What” at Colter and Del Rio was greeted by silence. Stardust did an inset promo calling himself the dark horse in the tournament and would become champion. Del Rio worked him over a while but he came back with a Side Effect and reverse DDT. Del Rio went for an armbar but Stardust countered with a disaster kick for two. Stardust went to the top, so of course Del Rio knocked his legs out and used a tree of woe double foot stomp for the win. This was uninspiring to say the least. They showed a replay of the Paige/Charlotte/Becky Lynch angle from Raw. Backstage, Roman Reigns told Renee that his journey to become WWE Champion has been like climbing Mount Everest. The closer he gets to the top, the harder it gets. On Monday, he meets an avalanche in the form of Cesaro, but Cesaro can’t stop him because “Nothing at this point can stop me now.” They replayed a clip of Triple H’s offer, but Reigns said he wasn’t a sell out and would be standing on top of the mountain as the sole survivor of this tournament. Reigns delivered his lines well but it was heavily scripted and it was hard not to notice. This was the main event. Harper and Rowan attacked the Usos before the match started. The Usos fought back and one Uso took down the two Wyatts with a dive outside the ring. The Usos jumped back in the ring and challenged Harper and Rowan to get in. Rowan jumped in and the match officially started. Harper and Rowan worked over Jey until he made a hot tag to Jimmy. He hit an enzuigiri and a crossbody for nearfalls. Rowan took out Jey outside the ring as Jimmy used a Samoan drop and running hip attack on Harper. He tried a dive to the outside but was caught by Rowan, and Harper followed with a superkick. Back in the ring, Harper hit a sitdown powerbomb but Jey broke up the cover with a splash. Jimmy hit Harper with two superkicks, and both Usos hit Rowan with superkicks, sending both bad guys to the outside. Usos took them out with dives, and Bray had seen enough. All four Wyatts attacked the Usos for the DQ. Bray mocked Taker’s throat slash as Harper and Rowan gave Jey a double chokeslam. Strowman followed by doing his stupid slam on Jimmy and Bray finished him off with Sister Abigail. Bray was about to do it again but the Undertaker’s dong sounded and the lights went out. Undertaker’s voice played over the speakers. He said the Wyatts would be dragged through the gates of hell and they would rest in peace. So I guess he accepts. This show felt more important than the usual Smackdown thanks to the title tournament. The first two tournament matches were good and it was refreshing to see Kalisto beat Ryback, even if he is just being set up for Del Rio. The rest of the show was lackluster, as it was laid out very much like Raw. The tournament took up most of the time and the show concluded with an angle for the Undertaker. Except, unlike Raw, he didn’t show up, so it felt pretty flat. It should also be noted that there was no women’s segment on this show outside of the one Raw replay (unless they add something for the Thursday airing in the U.S.). No match or interview. So there’s that.